The expression “a trapped nerve” is often applied to any pain in the neck which is sharp. This is incorrect. The characteristic of a trapped nerve in the neck is that it covers an area distant from the causal problem, in the distribution of a single nerve or nerve root. It may be a shooting pain, like a bolt of lightening, or a constant pain, tingling or numbness or if the pressure is marked it may cause weakness to particular muscles. Although the term “slipped disc” is still widely used associated with sharp neck pain a disc ‘herniation’ or ‘prolapse’ is an extremely uncommon condition; these terms should not be confused with a ‘degenerative’ disc which is common and a type of wear and tear and not associated with pain. Where is the nerve trapped? At The Spine Team we will listen to your symptoms and depending on how you describe your current pain and your history we will use examination tests to identify which nerve and where it is likely to be trapped. Disc prolapse in the neck it is very rare indeed, by far the most common cause of trapped nerves in the neck are mechanical where the nerve is trapped by the ‘mechanics’ as it emerges from the spine. There are conditions which occur in the neck inside the spine but rather than affecting a single nerve that then emerges, as we see in sciatica, many nerves that pass the area are affected on their way down, giving symptoms in lower areas of the body. 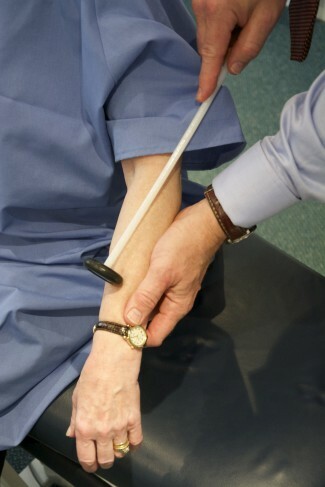 Your Spine Team practitioner will understand these conditions and be able to examine for evidence of such a condition. If a problem inside the spinal cord is suspected your options will be discussed giving a clear idea of what might be the best thing for you, which may include referral back to your GP with recommendation of imaging and a specialist opinion. Most patients with trapped nerves in the neck have ‘Mechanical Neck Pain’. If the problem is present in a structure that is close to the emerging nerve, such as the ‘Facet Joint’, it can cause nerve irritation giving neck, shoulder and arm pain. Soft tissue irritation outside the spine, to the mechanical components, can also lead to a group of nerve roots with conditions such as ‘brachial neuralgia’. Mechanical neck pain and nerve pain to the leg can be treated at the Spine Team, this is the commonist type of neck shoulder and arm pain we see and can be treated the same as Acute Neck Pain or Chronic Neck Pain depending on the conclusions of your Spine Team practitioner after your first visit. In deep referred pain to the neck shoulder and arm the pain uses the nerves to get around but the nerve itself is not trapped. These pains do not follow the pathway of a single nerve or nerve root but rather follow patterns within the muscles, joints and bones giving, as the name suggests, deep pain. This type of pain can be more constant and hard to control but is usually less sharp than a trapped nerve, it is also frequently associated with a postural or lifestyle weakness, particularly those in intense sedentary work. Your Spine Team practitioner will be able to help you understand this type of pain, particularly that recovery usually requires you to change the way you use the area while you have treatment, rather than just having the problem fixed; this may involve identifying and overcoming a postural weakness, an environmental or workplace habit or activity. It cannot be regarded as an ‘injury’ as there is rarely any suggestion of injury, there is also a tendency for the body to learn this behaviour as part of the problem increasing the likelihood that it can develop into chronic pain. This type of pain usually requires a change in lifestyle, either identifying and correcting the position, habit, posture or activity that puts you at risk. A willingness to appreciate and overcome this will be required to make a recovery from this problem once it has become chronic (lasting more than eight weeks).